Happy with your budget categories? Please share! 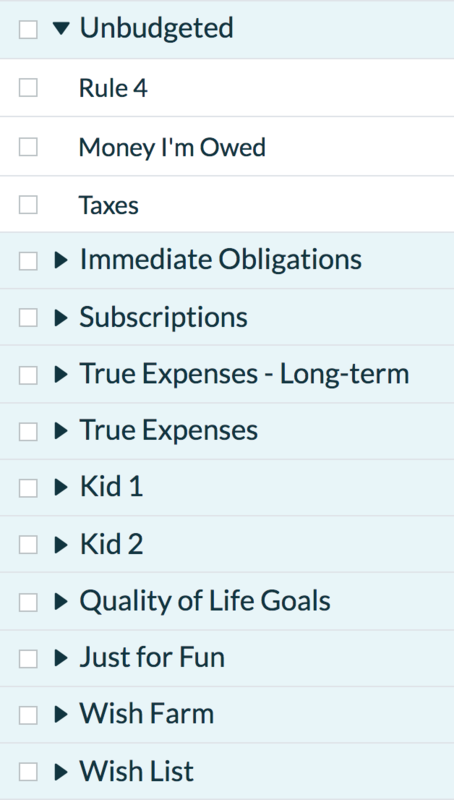 I'm curious to know how people organize their budget categories. Thinking of making some changes for 2018 and would love to see what people use (and don't use). What are your budget categories? I'm planning an overhaul for the new year as well, so I'm curious to see what other's have to say! Currently, my budget has category groups for things I pay every month, things I pay intermittently (like Vet bills), things I'm saving up for and things I'm paying off. I have mine separated out into Monthly Bills (rent, electric, cable, savings, student loans, cell phone, credit cards since I am paying them down, not using them- it works for me), Monthly Spending (groceries, eating out, gas, entertainment, kitkats, health, cash, personal type stuff, holidays/birthdays, defies categorization), Car Stuff (maintenance, inspection, registration, insurance, AAA, new tire fund), Upcoming (yearly expenses, like Amazon Prime or YNAB), and At Some Point (vacation fund, new laptop fund). What are yours? Violet Drill This was so helpful! I forgot to add AAA and Amazon Prime to my budget. Thank you! Do you have a Wish Farm yet? That is my budget categories. I want to simplify it, but I haven't imagined how very well. boodles8 Hi Boodles. Not sure if you'll see this but what do you define as special grocery? That line is for when I go to stores that are miles and miles away, where I only go a couple of times a year. Trader Joe’s is 90 miles from me, as is the store where I get my special tea. I stock up when I go either place. boodles8 Ah yes - that's a good idea. I feel like this would also be good for sale items that put me over my normal budget but only happen rarely. Thanks. 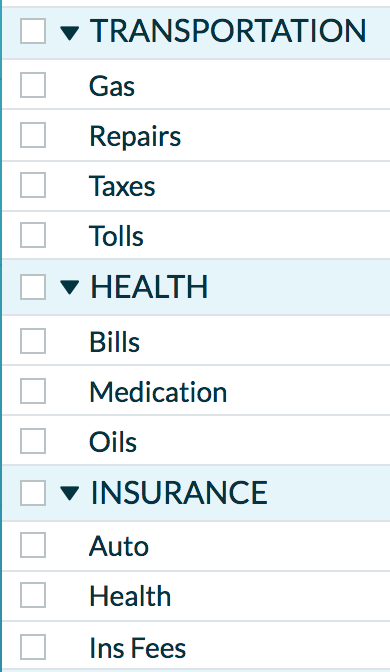 I keep the tax man category hidden until I need it because it makes me frown. Thank you for the opportunity to share. Not sure mine will work for anyone but me and here are my category groups. In total, I have 165 categories, all under one or another of the category groups. I have variable income and when funding a month, I fund the top with my "living expenses" first, then the bottom savings goals, starting with "Annual expenses" and ending with "Emergency funds." Then comes "Apt. Maint exp." Last to get funding is "Mo. Fixed Expenses" and I'm always working to the absolute end of the month to fill this one, which isn't due until the 1st of next month. The "Wish Farm" is my reward for funding everything else. If everything else is funded, I put $30 here. This is what I'm going into 2018 with, minus my credit card debt which I didn't screencap because there are numbers involved in their category names. Honestly, mine are pretty much the default ones. They were in YNAB 4, too. I like the KISS method, and the default categories cover almost everything for me. I have a category for my faculty union, two categories for reimbursables, and a wish farm, but other than that most of my categories are very close to the standard ones. I use a handful of category groups. The most useful thing I did for a (re)organization point was recently I created a First Priority group and put groceries, mortgage, transportation, home maintenance in there. That one is on top and dollars needing jobs look there first. Dominique Robin I also lump sooner things together and use notes to remember what's in the lump. Dominique Robin Thanks for pointing out how you use the notes. I also lump things together but have as many details as possible in the title and it never occurred to me use notes for some reason. That's about to change! Dominique Robin How did you get your notes under subscriptions to bump lines like that? I have been trying to do that forever! I hit enter or return and it won't let me have multiple lines for hulu spotify etc. I used to have a lot of categories, but it was too much work. Now I've simplified quite a bit and it's been a lot easier to deal with. 1. Fixed expenses - all my bills, daycare, & subscriptions (Netflix, etc) go here. I don't break it down into subcategories. I know what my fixed expenses are each month so it's no surprise how much I need to budget here. 2. Savings - I break this down a little into Property Tax, Experiences, Short Term Expenses (professional dues, annual furnace maintenance, gifts), and Investments. 3. Discretionary - food, dining out, clothes, pretty much everything else goes here. Again, I don't break it down into sub categories. Pretty much whatever I have left in my budget goes here. I don't really care how much I spend on groceries vs dining out vs other discretionary expenses. This is money I can do whatever I want with and it's a nice feeling. Purple Motherboard (91bf57519732) it seems like this could be challenging when it comes to making decisions based on the budget, like, if I have $50 remaining in my grocery category with 10 days still in the month, I know I need to be careful... but with a bigger pool, is it hard to have a sense of what you really have available for different purposes? Such a great topic! I worked and reworked my categories in YNAB 3, then 4, for years. 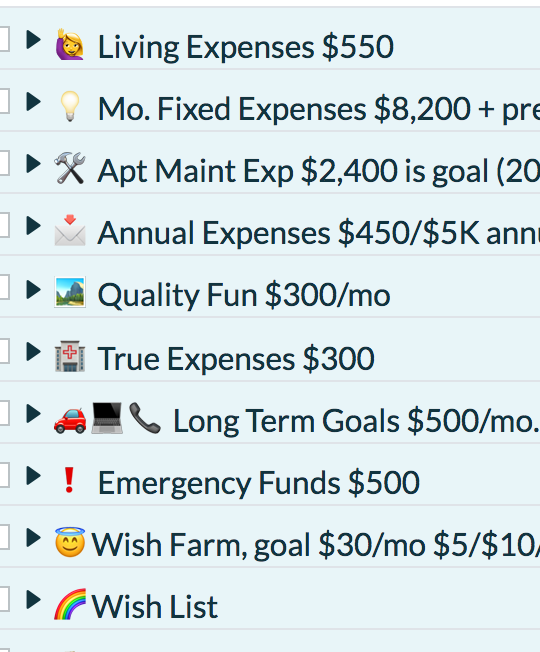 Then with the new YNAB, our team got a little more method-y with the default categories. They start with the most necessary at the top, and gradually become more, well, Rule 3-able toward the bottom. I like that order because when I'm budgeting (Rule 1-ing, if I may! 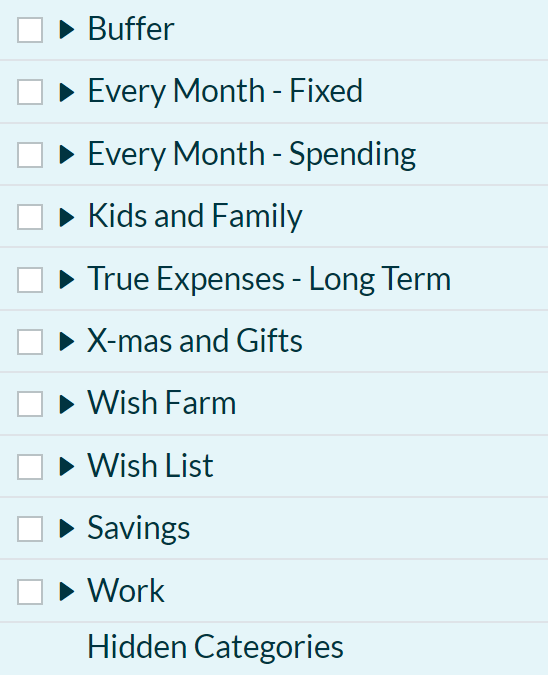 ), I can start at the top and budget those really essential categories first. Or when I'm adjusting for overspending (Rule 3-ing), I can work from the bottom up, pulling money from the lower categories first. I opened up Unbudgeted to explain what it is. Jen Thanks! How does "Money I'm Owed" work? Ryan Oakley Oh good question! I use Tracking Accounts and Splitwise for people I regularly owe or am owed by (my sister, my mom, my honey). Here's a video I made explaining how Splitwise works with YNAB in more detail. And here's how to use a Tracking Account for a loan you make to someone (however small). That Money I'm Owed Category usually has zero in it because I settle up quickly. I don't like orange or red on my budget ever! Jen Thanks for the video! I've been "trying" to use Splitwise with my girlfriend now that we are living together. It got way too complicated so now we're both now sure where we are at and who owes who how much. But we may try it again with this new information. One issue is that she often forgets to enter transactions into Splitwise. I suppose we can go back into her YNAB to figure out what the transactions are. Still trying to find the simplest solution that works. We don't want to be spending hours on this stuff every week. Ryan Oakley Sure thing! Splitwise is easily the most challenging part of my budget, by far. Here's the key: settle up quickly. Like, immediately, if possible. Ryan Oakley what would that look like? That is, what would the perfect solution be, for you? Jen Well, perhaps you could link your YNAB with someone else's (roommate or significant other)....so that certain categories could be set to 50/50 or 60/40 shared. If your roommate buys groceries, 50% of the transaction automatically shows up in your grocery category on your YNAB and then there's a new category created that would then show that you OWE your friend that amount. Kinda like how credit cards are set up. Does that make sense? Jen The more I think about this feature in YNAB, the more I really really want it. I wonder how many people have a similar issue. Basically it's the "roommate" problem - whether that's your college buddies or a significant other where you haven't combined your income/expenses. Ryan Oakley Jen I too would find a full integration with splitwise superbly helpful. Both for my roommates and my boyfriend. It's great to just use splitwise if spending ends up even and I already planned to spend that money, but it's annoying if I'm trying to keep track of how much I'm dining out, for example. Jen Having a "Rule 4" category is the greatest thing I've ever seen. Thanks for the inspiration! Jen Hey is there anyway you can go into a little more detail as to how you use the "Rule 4" category? Angel Claudio Sure! It's very simple. Whenever I get income, which is about 3 times a month, I give that the category Inflow: To be Budgeted, and then see that in the To be Budgeted at the top of the Budget. I click on the TBB, move that money to the Rule 4 Category, and then let it sit there. I check to make sure it matches the Total Income on the right side of the Budget, in the Inspector. When the end of the month happens and it's time to budget next month, I move all the money in the Rule 4 Category back to the To be Budgeted, and then click forward to next month. It's there and ready for me to budget. There's never any amount budgeted to that category in past months, because I pull it out at the end of each month. Let me know if you use that trick! I want to preface this by explaining that we are in the last decade of our working lives and are in our peak earning years... our only remaining debts are a mortgage and car payment - both of which will be paid out in full in early 2020. YNAB helped us get here! Our mortgage and car payment are in in the 'debt' section, not the housing or transportation sections. We separated our wish list categories because so many of the items were Home Improvement/Decor we felt they deserved their own acreage! The dollar amounts are 'about' what we wind up budgeting in total each month, in each area. The 'retirement' totals in brackets are amounts that reflect our employer/employee pension contributions - so they actually 'disappear' off our paycheques before ever hitting YNAB. Housing includes savings for major repairs, appliance replacements, property taxes, and utilities. Yes, we spend a lot on groceries and dining out. Health and fitness includes saving for hearing aid replacements (expensive! ), other medical expenses, and our gym/trainer expenses. "Allowances" covers our separate spending for fun money categories as well as clothing and hair cutting expenses. "Fun and travel" covers date nights, fancon expenses (if you have to ask, you'll never understand) and trips we make on a regular basis (i.e. to visit his family or my family or our children who moved to other cities instead of staying close to home!). The vacations category with the tractor/plan emojis is vacations harvested from the wish farm. I appreciate this topic! 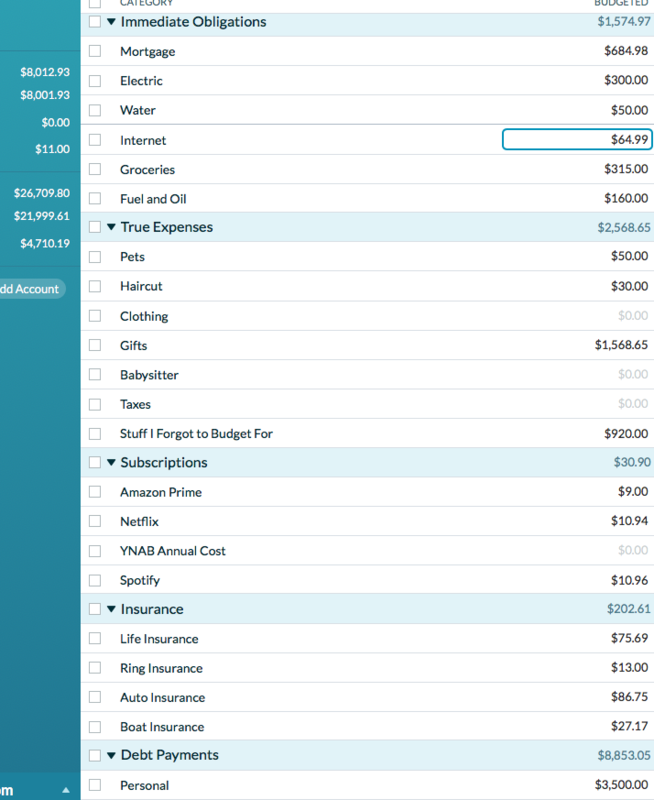 We've been using YNAB for around 6 years and have arrived at a category framework that I think is simple yet also detailed and informative. We have 3 main categories - NEEDS, WANTS and SAVINGS. I picked up this idea many years ago from a book called "All your worth" ( https://www.amazon.com/dp/0743269888/ref=cm_sw_r_cp_awdb_t1_4KCnAbSF0JRSK ) by Elizabeth Warren and her daughter when she was *just* a scholar and financial guru. She recommended keeping your Needs at 50% or less of total take home pay, Wants at 30% and Savings/Debt Payoff at 20%. I love this as a benchmark but we are stuck at about 70% for Needs due to a high mortgage, leaving only a sliver for Wants and 20% for our debt paydown. Tan Screwdiver (6bc2159cfc02) For the Elizabeth Warren approach, how are you calculating your 100%? For example, healthcare and taxes come out of my paycheck automatically and I try to think of that as money I never had. Do you add your healthcare costs back in to your 100% and then use that as part of your 50% needs? Coral Wrench Hi - I keep it simple and just look at take-home pay. So, I'm not factoring in dollars that come out of check for benefits, taxes, etc. And to be clear it is a guideline that living in a NYC submarket makes it very difficult to actually meet. I attached a screenshot of mine. I have kept YNAB's basic ones, tweaked a few. For organization sake, besides the normal True Expenses, I have an Annual True Expenses and Semi-Annual True Expenses, category. gas/tolls/parking, cell phone, six flags membership (don't judge), lexington law (I have had a rough go), student loans, walt disney world annual pass (on FL resident payment plan....switching that to full annual expense in May), car insurance, storage unit, & entertainment subscriptions (netflix & spotify). Financial Freedom! contains two subcategories: Debt Snowball and Emergency Fund. I've realized that paying attention to the specifics of each of my debt accounts is complicating and distracting things for me, and at this stage in the debt paydown game (i.e. early on! ), I want to focus mainly on the TOTAL $$ I am throwing at debt paydown each month. I'm including Emergency Fund in the same group since I'm just aiming to maintain a $1000 mini fund at this point, while focusing on reducing debt. Fixed Monthly is for necessary expenses that are the same each month, which are surprisingly few (Rent, Car Insurance, Cell service). Lumpy Essentials are necessary expenses that are either non-monthly or vary each month. 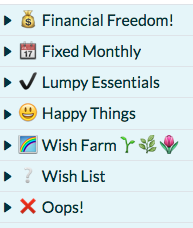 Trying out Wish Farm & Wish List per recommendations in this thread! Resistant Punch Roller Haha, you win best use of emojis! Your CATS category made me lol. Resistant Punch Roller ooh, I totally agree. Is there any easy way to get the emojis from my computer or do I have to edit the categories from my phone? I keep mine pretty straightforward. Instead of getting too granular with the categories, I use the "Notes" section as a reference of what's included in that category. For example my "Home Needs" notes says "home maintenance, technology, upgrades, household purchases, exterminator, lawn maintenance." This works well for us! Does anyone have a tip for reorganizing past transactions into new categories? 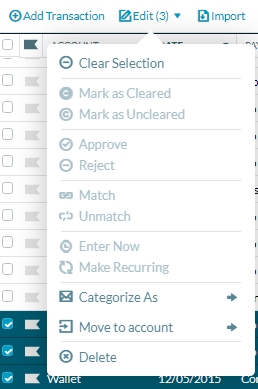 I want to further divide my categories to track them separately. I created a new category and tried to assign past transactions to the new category, but when I do, it completely screws up my budget. 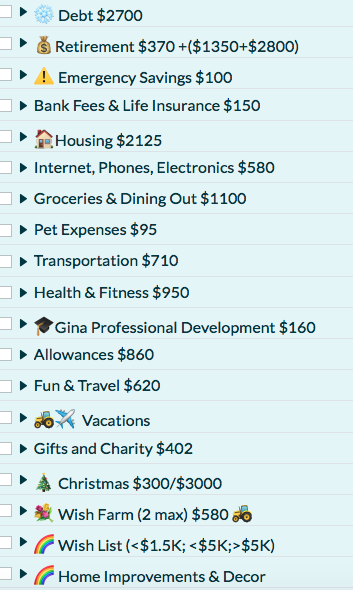 I would like to organize my budget differently but I don't want to make any changes to my beautiful budget until I figure out how to get around this quirk. The best practice is to create the new category and just go forward and forget about splitting off past spending into different categories. That said, I have actually done what you are attempting to do, and can provide a step-by-step to walk you through it. Proceed with caution. You can seriously mess up your budget. If you are using YNAB4, you have the option of just loading an earlier version, one prior to you messing around, and there is no harm done. If you are using the web version, nYNAB, you can keep hitting the undo to get back to where you started, but only if you haven't refreshed your browser or logged out. After you've gone through all the transactions to be moved, now it's time to fix the funding on your budget screen. 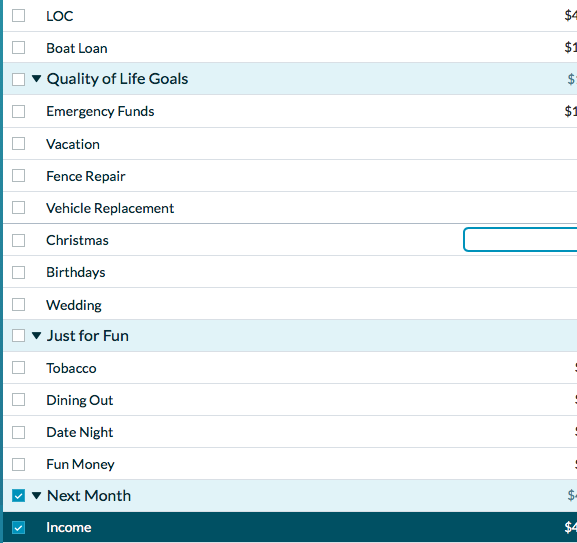 You will have to move funds from the original category to the new category to cover the red negative you created in your budget. Start in your oldest month and move forward. Each month in which you had transactions that you moved will now have a negative number that needs to be addressed. As an example (to get a screen capture) I created a temporary category, moved three old transactions, and on the budget screen, the negative number is showing that I did not budget the funds necessary to cover recategorizing the transactions. At this point I can click on the original category (which has 281.10) and use the move money tool to move 96.81 from the original category to the new category to deal with the negative showing in this month. To recap: First move all the transactions to the newly created category. Then fix the red negatives in each month by starting in your oldest month and moving forward. Seriously consider just going with the recommended method and not altering historical entries. You only need to move either the restaurants or the groceries, afterwhich you would rename the old Food category to read either Groceries or Restaurants. Thank you for taking the time to clearly explain the process and demonstrate what happens. You have a great tip to keep the new category directly under the old one to make the transfer easier. When I tried this earlier I couldn't keep track of what needed to be moved so I reverted back. Based on the volume of transactions I would have to do, it would probably be best to leave the old transactions and do as you say, just move forward with the new categories in the future. I MIGHT try moving my business expenses starting in 2018 since that is a smaller volume of transactions to have to reshuffle.